Do you head out too much and want to get weather updates live on your lockscreen? Well, it is now possible! iOS 7 themes: live weather updates on lockscreen! 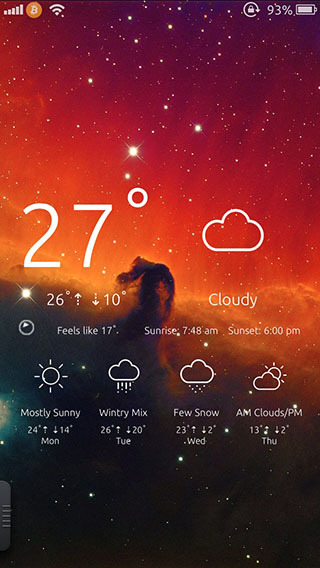 iOS 7 LockScreen Weather iOS 7 theme will help you get live weather updates on your iDevice’s lockscreen. The beauty of this iOS 7 theme is its blending with native iOS 7 looking beautifully integrated. The iOS 7 lockscreen weather theme is developed for any device with 4 inch screen. Which means iPhone 5S, 5c and iPhone 5 are good devices to get this theme for. However, it works well on other devices too. – Aura and Other Popular iOS 7 Winterboard Themes – The Best So Far! Launch Cydia and install Cydget if it isn’t installed already. Get and install iOS 7 Lockscreen Weather theme. Tap on config.js file and then edit it. Scroll down and look for document.cookie=”cookiewoeid=12345″ – 12345 is the WOEID (where on earth identifier), unique to location. Replace the WOEID with the one for your location. You can get the WOEID from this link. By default, weather is displayed in Celsius degrees. However, if you want to get the temperature in Fahrenheit, you can change the value of variable cookietemp to “f” from “c”. After replacing the value, simply tap on the Save button. To customize, go to native iOS Settings app and go to Cydget > Lock Cydget Order > iOS 7 LockScreen Weather. Here you can elect to remove the welcome screen message when you install Cydget along with a couple other customizations. Let us know if you have tried any other iOS 7 themes bringing weather right on your lock screen!